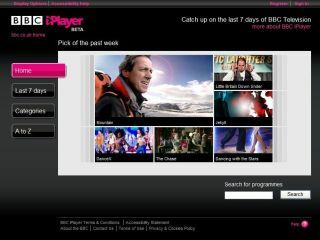 The BBC has partnered with Adobe to make its iPlayer on-demand software work on non-PC platforms. The "strategic partnership" will also extend to video content on the BBC's other sites, such as BBC News. The change to the Flash-based system means the catch-up iPlayer service will be available on Mac and Linux as well as Windows by the end of the year, but it will only be available to non-Windows platforms as streaming media rather than downloads for now. Erik Huggers, BBC future media and technology group controller, said: "I'm delighted to announce this strategic relationship with Adobe. It is important to ensure that BBC iPlayer is available on as many platforms as possible." It's unclear where the move will leave Microsoft, which currently powers the iPlayer with its DRM-based Windows Media technology. The BBC and Microsoft have been close in recent times, leading to criticism from organisations such as the Open Source Consortium (OSC). It could well be the case that Microsoft couldn't provide the download methodology for the iPlayer to work on other platforms as we speculated it might, hence this latest move, but it seems likely . According to Adobe, the BBC iPlayer will have its consumer marketing launch at Christmas when it will offer downloading and streaming services. It will also incorporate radio, though it's not clear whether this will supersede the current BBC Radio Player offering. But the partnership reaches further than just the iPlayer. According to the details released by Adobe, "the strategic relationship will also allow the BBC to provide a single consistent user experience for the majority of streamed video and audio content on bbc.co.uk". So for the BBC it could be goodbye to RealPlayer and even Windows Media, the two formats it currently makes its clips available in. By moving web video across to Flash, the hope is surely to make download times quicker and accessibility better. Adobe says the BBC hopes to "ensure all its rich-media content is accessible to the widest audience possible". "[The move] will offer our audiences increased flexibility as to how and when they consume our content, both live and on-demand, on bbc.co.uk," said Huggers. "Adobe's video solutions will revolutionise how we create and deliver content to audiences in the digital age." "The move to Flash Player-compatible video will help the BBC engage audiences by delivering a seamless, instant-on web video experience," added Bruce Chizen, chief executive officer of Adobe. However, Adobe's bulletin does make it clear that the relationship is a non-exclusive one, so the BBC may still use formats such as Windows Media for streaming, for example.